Former Times staffer on Jeopardy! MEDFORD — Buck Rollins never gets sick of pie. Not at the beginning of an overnight bakery shift, facing 12 or more hours of pressing dough or piling fruit into pans. Not six hours later, when he finds his groove and pie-making takes on a Zen-like rhythm. Not even at the end of the night, when up to 2,500 pies have passed through his hands. Rollins leads the 38-person pastry team at the Whole Foods Bread and Circus Bakehouse here, playing a key role in churning out 80,000 pies destined for dinner tables throughout New England, New Jersey, and New York City. As Americans sit down for their annual ritual of family, turkey, and overeating, they can expect to spend on average $49.48 to make a Thanksgiving dinner for 10, including $5.53 to make two homemade pumpkin pies, according to the American Farm Bureau Federation, which represents farms. For Rollins and his team, Thanksgiving also means a much needed break after spending the last week and a half making pies nonstop. That amounts to about 8,000 pies a day — 10 times what the Whole Foods bakery typically produces other times of the year. By the time Thursday rolls around, the team will have turned 25,000 pounds of flour, 11,000 pounds of butter, 22,500 pounds of sugar, and nearly 20 tons of fruit into the most quintessential of Thanksgiving desserts. Not only is Whole Foods focused on pies, but so is Stop & Shop Supermarket Co., the region’s biggest grocer with 220 New England stores. While it does not bake its own pies, the chain expects to sell some 250,000 pies this Thanksgiving, said spokeswoman Suzi Robinson. Maine-based Hannaford Bros. sells 168,000 pies in 181 stores during November, some made in-house and others from outside vendors, said spokesman Michael Norton. The Medford bakery is one of five Whole Foods has around the country, but the Massachusetts facility makes, by far, more pies than any of the others, according to the Texas-based grocer. “Sure, there are easier, more efficient ways to produce the quantity of pies we sell during the holidays, but the priority for Whole Foods Market is making sure our customers get a delicious pie,” Rick Bonin, vice president of the company’s North Atlantic region, said in a statement. The pie-making marathon at the Medford facility begins more than a week before Thanksgiving. This year’s goal: turn out 27,000 apple pies, 20,000 pumpkin pies, 16,000 pecan pies, 10,000 blueberry pies, and 7,000 cherry pies for 52 stores. Hanging on the wall in the bakehouse is a thermometer-shaped “Pie-O-Meter,” marking the pastry team’s progress toward these numbers. Late last week the team was more than 80 percent of the way to its target. They get there by going from one daily shift to three, turning the bakery into a round-the-clock operation. The crew working so hard to produce dessert for this distinctively American holiday is a thoroughly international group. Rollins banters with them in English; they respond in accents inflected by their native Burmese, Spanish, Cantonese, and Creole. The concept of using crust to contain other ingredients has been around since ancient times, said food historian and author Barbara Haber of Winchester. The now-traditional pie trio of apple, pumpkin, and pecan probably evolved along with Thanksgiving, as a way to incorporate some of the distinctly American ingredients that are abundant at this time of year, she said. At Whole Foods, the pie process begins with the crust, a simple mixture of flour, butter, dry milk powder, salt, and water. Each 350-pound batch of dough is divided into smaller balls, which are individually pressed into foil pans. Another group of bakers loads each shell with a filling made from fresh fruit: apples, blueberries, cherries, pumpkin. 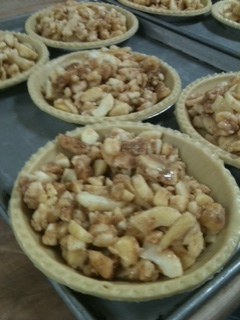 Workers then top the pies with another layer of dough or a thick sprinkling of sugary crumbs. After assembly, most of the pies are frozen and shipped to Whole Foods stores, where they are baked on premises. Pies hit the shelves within 24 hours of baking. Most of the 9-inch pies sell for $11.99; pumpkin pies cost $9.99 and pecan pies are a little pricier at $14.99. From a ball of dough to golden-brown doneness, each pie takes about eight hours to complete, Rollins said. After all this, he really never gets tired of pie? This story originally appeared in The Boston Globe on November 21, 2012. Click here to see the story, video of the pie-making facility, and graphics breaking down pie production (pie charts, if you will).